I’m not great with uncertainty. I’m a Virgo. It’s not my fault. (Maybe it is, but we can psychoanalyze me later…) What’s relevant to this story is that I’m an earth-being who likes certitude and routine; that I am learning to tell the difference between when that’s powerful and when it’s hindering me; and that when I said “yes, I want to go to Australia,” and booked the tickets, I didn’t realize I was leaving on the first day of Mercury retrograde. One of the defining characteristics of Mercury retrograde is that travel and technology get seriously wonky. Things that should be running smoothly don’t, despite our best efforts. A lot of the astrologers I follow frame it as the cosmos forcing you to slow down, teaching you the lessons you need to learn by going over the lessons you thought you’d learned already. The hardest part of my deschooling process has been getting comfortable living in uncertainty; I thought I had mastered dealing with my uncertainty, learned to live in it. And it’s true, in the past year-and-a-half I’ve gotten a lot better at it, and felt a lot better in the process. But when, on the morning of my flight, I woke up and saw it was really, truly snowing, the knot in my chest, the familiar tight, panicky feeling, told me otherwise. I got to JFK and had to get in a massive line to check in – when I got to the front of the line, my generous buffer time had disappeared. Turns out the reason I couldn’t check in was a visa issue. I was flying to Australia via Abu Dhabi, where I had a short layover before my second flight, but I couldn’t get on either plane without my visa clearing Australian customs online. A frenetic man in red glasses behind the counter helped me (reapplying for the visa, waiting 15 minutes, realizing it hadn’t gone through, reapplying again, waiting again, panic mounting but trying to stay calm as the line dispersed through security and I watched my buffer time tick down and….) and finally, I was checked in. I had no bags to check, just my backpack and a small carry-on with my notebooks, so I dashed off to security and made it on board just in time. So there I am, sitting on the most massive plane I’ve ever been on in my entire life, strapped into a window seat with 300 other people all anxious to get away from the raging first-day-of-New-York-spring storm, while the flight attendants fluttered about in pre-flight prep. The door is closed. I’m strapped in, my neighbors are strapped in. What’s happening, what’s happening? My mind is racing. Then, the captain gets on the intercom. My heart is thumping. I look out the window. It’s snowing so hard I can’t even see the plane next to us. And that’s when I realized: I have no power over any of this. I can’t control the weather, or how long it’ll take to shift. I can’t decide when it’s safe for us to take off. I’m about to fly around the whole world, further than I’ve ever been, to go to a place I’ve never seen, to meet people I’ve never met, and do work to support them in some way that I don’t know yet. I said yes, and now I’m here. I don’t know if I’ll make my connection and I don’t know what will happen if I miss it. There’s only one choice I have in this moment: I can panic, or I can choose not to. I chose not to panic. We sat on the runway for 2 hours, which meant that by the time the plane took off, I already knew I would miss my connection. I held my panic in check with distraction, and sleep, and focus on my breathing. None of the flight attendants could tell me anything about what would happen when we landed, just attempt to reassure me that I would get to my destination. When I landed in Abu Dhabi, got in a shuttle and drove across the strange, sleeping desert city and stay in a luxury hotel, courtesy of my airline. 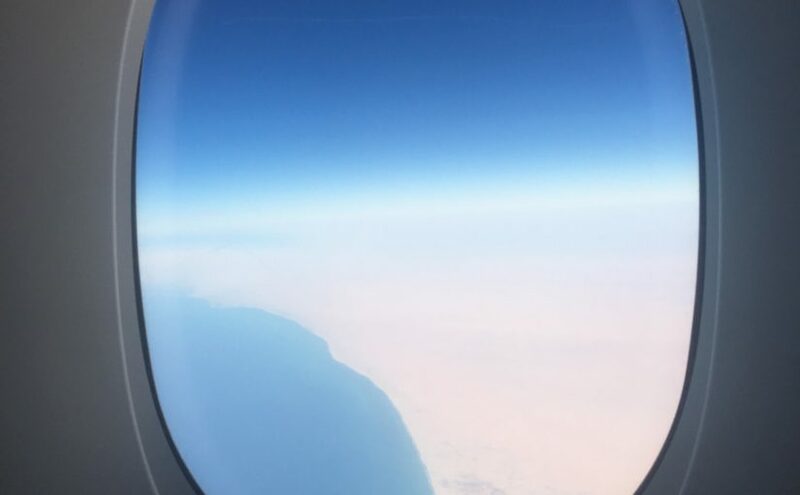 And on the way back to the airport the next morning, I got to see the sun rise over the desert – red in the sky like a bloody yolk, like a burnished ruby – and as we flew over the country I saw endless undulating desert, then rocky, fractal mountains, and then the blue sea. I had an empty seat next to me on the flight from Abu Dhabi to Sydney. I wrote and drew and reveled in the liminal space of the journey. I traveled through, traveled outside of time. I landed in Sydney, got on a final plane to Brisbane. And when I got off the plane in Brisbane, there was, in a sun hat and ALC shirt and no shoes, a human grinning at me. “You must be Tom,” I said. “I am! Welcome!” he said, and we hugged. I had arrived.